Dusty Baker; what can I say? He is the most notable manager Cincinnati has had since Jack McKeon (291-259 during '97-'00 with the Reds). Upon his signing in 2008, I felt it gave the Reds some instant credibility. He took over a franchise that was in complete shambles (514-620 during '01-'07) and in the third year of his tenure, the Reds are coming together as one of MLB’s best teams. You would think fans would start to take notice, but all we can seem to do is wait for him and the team to fail. I myself, am a Dusty fan. I think a young team looks up to his leadership, fire, and positive attitude. The two time all-star and 1981 Gold Glove recipient had a very solid career as a player (.278 AVG, 320 2B, 242 HR). The Reds skipper also served six years in the military (1969-75). So why is it that every time I tune into a local sports show, all I hear is negativity from callers and hosts? Don’t give me that lame Kerry Wood and Mark Prior bit. You have seen Dusty be nothing short of careful with the use of young arms such as Johnny Cueto (averaged 173 IP in '08 and '09) and Homer Bailey (113.1 IP in '09) early in their careers. Don’t give me the “he’s not a winner” speech either. As a player Dusty was part of the 1981 L.A. Dodger championship team and he currently owns a victorious 1363-1254 managerial record. Between the three teams Dusty has managed (Giants, Cubs, and Reds); one went to a World Series ('02 Giants), one was five outs away ('03 Cubs), and the other is on the up and up for the first time in 15 years. The fact that he has only managed three teams and you know who he is speaks volumes. Now in his third season, the Reds are looking good and Dusty is still looking for respect in the eyes of Wild Man Walker, Ken Broo, and various other local sports personalities. Are we never happy or do we need to hunt for reasons to criticize? I think it would be a great accomplishment just to make the playoffs at this point, but fans and local media will destroy Dusty if we fall anything short of a championship after only a half a season of success. By no means am I saying that Dusty Baker is the best manager in the world, I just wish fans would realize the mess that Bob Castellini inherited and the strides made to compete in a short period of time. The Reds have new ownership and a new established GM in Walt Jocketty. Dusty is only a small piece of the cherry pie. Finally, we have players left and right coming out of our own farm system like Joey Votto, Johnny Cueto, and Travis Wood etc... I have been a Reds fan my entire life and have seen everything from terrible ownership to terrible manager hires. Take Bob Boone for example if you want to talk about lineups (a famous pet peeve of Reds fans). Can you remember Boone batting Adam Dunn leadoff in 2003? Enough said for me. 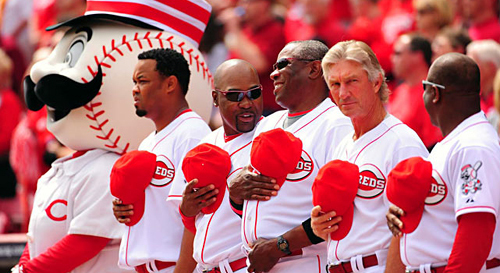 It's tough to recall such an uproar over a manager in Cincinnati during recent history. What a bunch of ingrates. It’s funny that Wild Man Walker and Ken Broo’s opinions are not shared with the national media. If you tune into Baseball Tonight, you will hear more professional opinions and will hear Dusty and his organization getting their due. I can’t help but imagine that if Joe Torre was in his third year of managing a small market team like the Reds and was successful, he may be overly praised by these local know-it-alls. You can take what you want from that statement and will probably be right, just don’t take away my Dusty Baker.